Last week it was the month end, so I avoided the normal weekly Round-up of posts & instead posted a Monthly Wrap-up to collect the entire months posts in one place. Today, I’m back with another Round-up of posts for the past week. 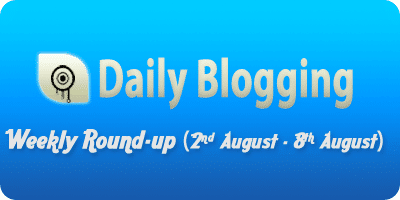 This week we introduced a new category called ‘DB News’ in which we will be posting all updates regarding DailyBlogging like the traffic stats, Monthly income, new features and news about DailyBlogging & so on.. This week I will be customizing DailyBlogging a bit, will come up with certain HowTo posts too about the same. So subscribe to our Newsletters. Have any suggestion/comments regarding some post ? Or you want certain tips on a particular topic ? Use the comments section to let me know! Yup both ways its good..also its fun for the authors too to write a list-up of the posts. Whoa! 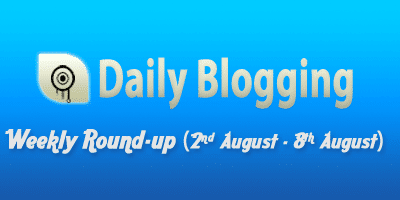 It is great idea to make a blog more attractive that you are doing weekly round up! Roundup post are great, because new users can easily read the previous posts. Welcome to DailyBlogging & thanks for the comment!